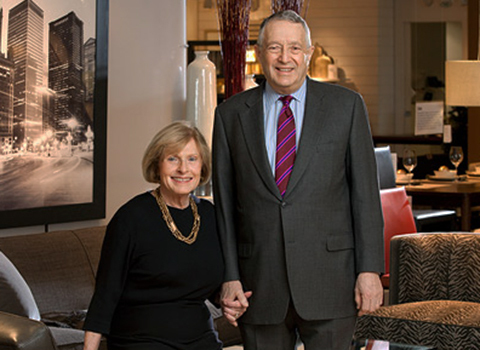 Gordon and Carole Segal, co-founders of Crate and Barrel retail stores, made a generous gift to Northwestern in 2007 that helped create the Segal Design Institute. Their generosity enabled Northwestern to significantly expand its undergraduate design curriculum in the McCormick School of Engineering, support the development of new master’s degree programs, and fund additional design research. Gordon Segal, who was CEO of Crate and Barrel until 2008, is a member of the Northwestern University Board of Trustees and a 1960 graduate of Northwestern’s Kellogg School of Management. Carole Browe Segal, who served as Crate and Barrel’s vice president of civic affairs until 2000, is a 1960 graduate of Northwestern’s Weinberg College of Arts and Sciences. Together, Carole and Gordon received the Marketing Salespersons of the Year title from the Sales and Marketing Executives of Chicago Association in 1992, the Entrepreneurial Creativity Award from the Brain Research Foundation in 1996, and the Lifetime Humanitarians Award from the Housewares Charity Foundation in 2006, among other recognitions. "We are very excited to make a contribution to Northwestern that will enhance its reputation as a leader in design," said Gordon Segal of their gift in 2007. "Companies such as Crate and Barrel need graduates who have been exposed to the principles of design. Design is probably the biggest competitive advantage the United States has in a rapidly changing and highly competitive world." "We need to create and nurture individuals who can anticipate, identify, and fill the needs of society," added Carole Browe Segal. "The Segal Design Institute will support creative design education for Northwestern students to meet those needs today and well into the future."